250 kg on one fall ! 1 fall (250 kg) or 2 falls hoist (500 kg). Lifting speed : 4 m/min (1 fall). Clutch on the safe side. Same iconic design that actual SR range (oval shape). Hoist body : 100% aluminum body, no plastic parts. Rotating upper and lower hooks. Rubber ergonomic grip on top hook. 4x11 chain (same chain as SR2). 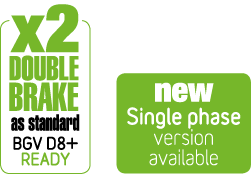 Available in Version A (direct control), version B (Low voltage control). Black CE P17 plug for better integration. “Perfect PushNew®” : new patented concept, 5 pocket load wheel, fitted with 5 intermediate teeth. This innovation provides improved chain guiding and chain flow, to help reduce the risk of chain jamming. Chainflux®” as standard. Horizontal ejection of the chain. Electric limit switch (on B version). 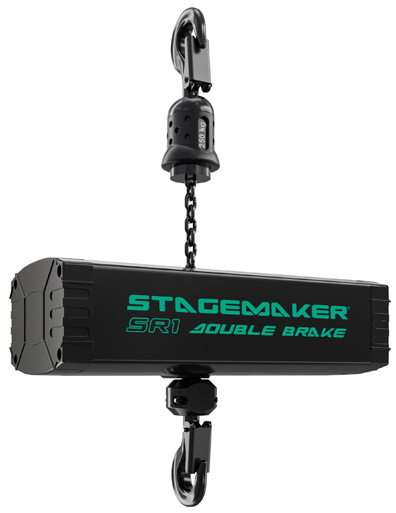 Stagemaker SR1 double brake fits perfectly in a 12” truss.